With DFV, the dual flow valve gives the same characteristics on rebound as it does on compression, thanks the damper fluid having a consistent path of flow in both directions. This means that the wheel and tire can quickly and effectively resume their important position back on the ground, providing grip and traction. The new Öhlins R&T range uses DFV technology on every single fitment, making it the perfect upgrade for the enthusiast that needs comfort and agility in the one unit. Figure 1: (Compression flow) At low shaft speeds, oil flows mostly through the shaft jet bleed (lower dotted arrow). At higher shaft speeds, oil flows mostly through the compression ports in the piston (upper dotted arrow). At very high shaft speeds, or during sudden shaft accelerations, oil can also escape through the compression ports in the DFV, increasing comfort. Figure 2: (Rebound flow) At low shaft speeds, oil flows mostly through the shaft jet bleed (lower dotted arrow). At higher shaft speeds, oil flows mostly through the rebound ports in the piston (upper dotted arrow). At very high shaft speeds, or during sudden shaft accelerations, oil can also escape through the rebound ports in the DFV, maintaining tire contact with the road. Because DFV opens more quickly and easily on minor road imperfections, ride comfort is surprisingly supple and more akin to an OEM strut than a coilover set-up. Over undulating surfaces, the compliancy of the R&T units allows the car to crest bumps and pot-holes, while still keep stable and in control. Traction is always maintained at its optimum level. When comparing suspension, why settle for second best? Figure 3: (Vehicle – no DFV) Without DFV the oil can not flow through the piston quickly enough on the rebound stroke after hitting a bump, so the tire is not able to stay in contact with the road. Figure 4: (Vehicle – DFV technique) The DFV valve opens, letting the oil flow quicker through the piston on the rebound stroke after hitting a bump, enabling the tire to stay in contact with the road. When adjusting ride height on coilover units, it’s worth comparing how it’s done. On many inferior designs, height is adjusted by raising or lowering the lower spring platform. This has the effect of compressing or extending the spring, which can limit the suspension travel that may cause topping out. The Öhlins method is to leave the spring seat in its perfect position, while the lower flange spins easily on the threaded body, to allow you to adjust with absolute precision while maintaining the perfect characteristics that we took so long to design in! Once you’ve set it all up, the adjuster simply locks off to maintain your exact settings. Dampers will get hot. That’s one thing that you can be sure of. As the piston moves within the damper, it generates friction – and therefore, heat. Although we can’t stop heat, we can deal with it, and this is yet another way that Öhlins differs from the competition. As the heat increases, the viscosity of the damper fluid can change, altering the car’s handling characteristics. Our unique needle bleed valve expands with temperature, closing the gap that the fluid travels through, maintaining a consistent damping rate. The best thing of all? You won’t even notice! All you’ll feel is that the car responds consistently, lap after lap, turn after turn; allowing you to concentrate on braking points and apexes while the Öhlins technology takes care of the damping. 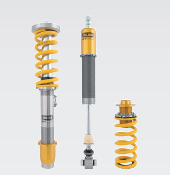 Backed by a 2 year limited warranty, Öhlins Road&Track is designed to improve the performance and comfort of your car. With Öhlins DNA integrated throughout, this suspension is the must have upgrade for your automobile. We currently offer 23 different applications with more being researched and developed daily.